And when the inevitable question, “should I use my fingers or use a pick?” comes along, again, the answer should be “yes.” Think of it this way: each new technique or idea you have when learning the guitar is like getting a new crayon. Yes, you can certainly create marvelous art with five or six crayons but, being lazy myself, I’d rather have a box of one hundred and eighty-eight crayons to choose from. Moreover (and pardon the pun), finger style guitar is not all that hard to pick up. In fact, it’s quite easy for most people to get started. And what I’d like to do with this lesson is to get you started. We’ll also toss in an easy song to help you practice your newfound finger picking skills. Remember that we’ve done some work on finger picking before. The Guitar Noise Easy Songs for Beginners Lesson on The House of the Rising Sun is an excellent place to start if you’ve not made any previous attempts to play finger style. Those patterns are simple arpeggios and will help you to just get used to the idea of tossing your fingers about on the guitar strings. 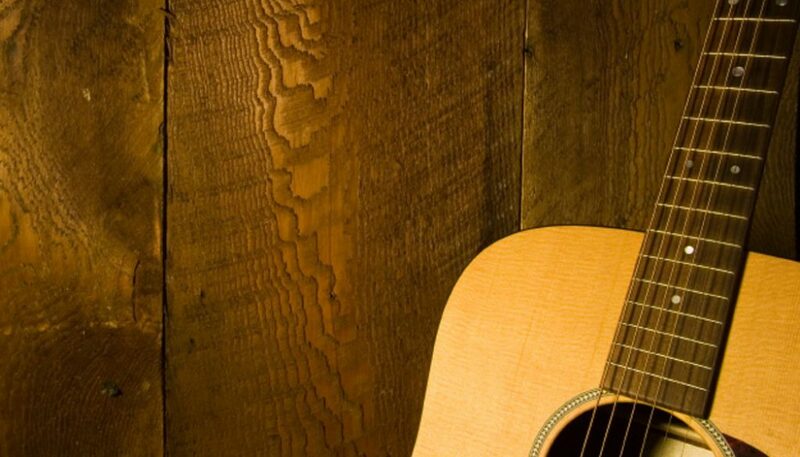 In this lesson, we’re going to tackle a style of finger picking called Travis picking. This is named after Merle Travis, one of country music’s enduring legends, whose guitar work gained him fame before he was twenty. Nowadays, people say “Travis picking” in much the same way we use words like “Xerox” to mean all photocopying, or “Coke” to mean all soft drinks. But the specific characteristics of Travis picking is the steady, almost metronome-like use of the thumb to play bass notes while the other fingers dance over the higher strings. And it’s this use of the thumb that offers most beginning guitarists something besides a fancy way of playing. Travis picking is an excellent way to help one develop a steady sense of rhythm. For the sake of this lesson, let’s get on the same page as far as finger labeling. And I mean the fingers of your picking hand, not the one on the neck! “T” will be your thumb. “i” will be your index finger. “m” will be your middle finger. “a” will be your ring finger. As I mentioned in the House of the Rising Sun lesson, if I was trying to teach you correct form and function, you’d use your thumb to play notes on the three lowest strings (low E, A and D), your ring finger on the first (high E) string, your middle finger on the B string and your index finger on the G string. But, as you can see in our very first example, we’re not going to go strictly with those guidelines. The goal here is to use the thumb to keep the beat and if that means it’s playing a “forbidden string” for our lesson, so be it. Okay, back to our thumb. See if you can work Example 1 without looking at your hands. Either hand. A good benchmark to set for yourself with almost anything on the guitar is to try to play a technique without looking at your hands. Then while singing or holding a conversation. If you can get to that point with these simple finger picking exercises in this lesson, then you’re well on your way to becoming fairly proficient at basic finger style guitar. You can see and hear how the notes played by the fingers are coming in on the off-beats, right in between the notes played by the thumb, which are on the beat. The fingers are also moving in the same direction as the thumb, namely one string closer to the floor. The first time you try this, you want to work slowly. It also helps immensely to count out loud (as I’m doing in the MP3) in order to keep your thumb going with the correct timing. You probably won’t have to do that for long. And you’ll also be surprised that your fingers will get faster and faster before you know it. Also, don’t be too concerned about a name for this particular pattern, or any pattern for that matter. We’re calling it “parallel motion;” some teachers call it “inside out,” some call it “Fred” (don’t ask!). Rather, think about this: One of the fascinating things about finger style guitar is how quickly most people’s fingers take to a pattern. But that’s also one of the biggest traps of finger picking. Once your fingers latch on to a pattern, it’s hard to break out of it and you can find yourself sounding a bit robotic. So let’s change our pattern, shall we? How about reversing how we play the fingers? Many of you will find this “contrary motion” (or “outside in,” if you prefer) pattern a little easier. It’s used in many, many songs and, again with some practice, you should find that your hands take to it pretty well. Pretty good for someone who’s just started finger picking, huh? This is why I’m harping on getting to the point where you don’t have to think about it. When you can trust your picking hand to do its job, then you can get fancy with the chord changes and even staying on a single chord offers more musical possibilities than you might imagine. The patterns for the A chord, since A is a “root five” chord, will also work for Am and C, not to mention A7 and C7 or other variations of these chords that you know in open position. Likewise the patterns for G will serve you perfectly fine if you’re playing any other “root six” position chord, such as E or Em. The other thing to note here is that you also have other options when it comes to which strings you decide to play. I chose these patterns for the A and G chords because I like the sound. For instance, some people might like to play the open G string as the second “thumb” string instead of the open D, as shown in the previous example. And if you play your G with the D note (third fret of the B string) covered, then you’re going to have yet another different sound. Some people like to stick with the inner strings when playing root five chords, so on the A chord you’d be striking the open A string with the thumb, then (if using parallel motion) the G string with the index finger, then the D (thumb again) and then the B (middle finger). If you want a more ambiguous sound, eliminating the B string when playing the A chord means that you’re just playing A and E notes, which make up the A5 or A “power chord.” And you can also play a pattern for the A chord where you occasionally lift your finger off the B string (temporarily creating an Aadd9 chord), much as we did with the D chord in Example 4. Telling you all this is not meant to overwhelm you with decisions. Rather, it’s to give you reasons to explore what you can do with even the simplest of patterns such as this. While you’re practicing these particular chords (and others we’ve mentioned), don’t be afraid to experiment and to listen to all the possibilities that you can come up with. Try to get the sounds into your head and be sure to write down all the ideas you especially like. As you can hear in this example, you don’t really want to just hang on to the same pattern over and over. It feels a lot more organic and real when you sometimes “slip up” or change from one pattern to another. And don’t forget about using the ideas in Example 4 when sitting on the D chord for more than one measure. I hope this brief introduction to Travis picking has been enjoyable for you. Even more important, I hope that you’ve found that finger picking isn’t truly all that hard. We’re going to do a number of articles in the near future that will build on what you’ve learned here, so if you’re enjoying working on this, please take the time to get your confidence in your picking abilities built up. It’s not all that far a step to go from this lesson to some of our Intermediate lessons, such as Scarborough Fair, Fields of Gold, or Time After Time. Thank you Thank you for such a wonderfully instructive site. I have been trying to play for a few years now, thought I was beat but you have given me new hope. Thanks again! David is a brilliant teacher; his explanation is the clearest I have yet seen. Many thanks. Very excited to have stumbled across this site. If I can’t improve with the aid of these great lessons (after 45 years of false starts) , then there’s no hope! Thanks, David. I just wish to tell you how much I enjoyed this article. It was the best I have found yet and the way you explained and illustrated was very easy to grasp and interpret. Before now I always had a tendency to NOT being able to sing along with my playing correctly. I have much hope now of being on the path to correcting that issue. Do you ever do articles on strumming patterns for various time signatures ?? I am having the greatest difficulty when it comes to reels,jigs,and 9/8,12/8. IF you did I thought that I may be able to understand your explanation and examples. It would be most appreciated ! !